DROPPINGS – dark brown and about the size of a grain of rice, found along the foundation of the home, near HVAC units, pool pumps, furnaces, water heater closets, wood piles and attic crawl spaces. GNAWING – on PVC pipe, pipe insulation, wiring, wall and ceiling insulation, patio furniture cushions, storage boxes, stored clothing, paper products and fallen citrus. SOUND – it’s not uncommon for homeowners to actually hear the pitter patter of rodents at night coming from inside their walls or above in their ceilings. 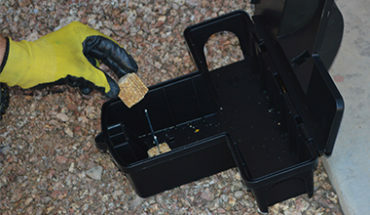 Pack Rats can be controlled with a variety of measures from; live traps, rodent bait stations, snap traps and glue traps. 911 Pest Defense offers a year-round program for residential and commercial customers as well as 90-day programs designed to eliminate rodents from structures. Identifying rodent access areas and providing physical barriers is critical to help keep rodents from invading your property and worse, the interior of your home. Screening off openings in perimeter walls and gate areas as well as entry points for pipes and cables that connect to the home is important. Keeping bushes and trees trimmed and away from home is recommended. Not leaving pet food out, especially at night, is also advised.